Lord, thank You for Your grace. It is by grace that my heart was drawn to You—grace that was extended, not in limited measure, but in abundance; not sprinkled down, but poured out; not just enough to get me by, but more than enough to bring me through as more than a conqueror. I receive Your grace—I run to it, welcome it, embrace it. 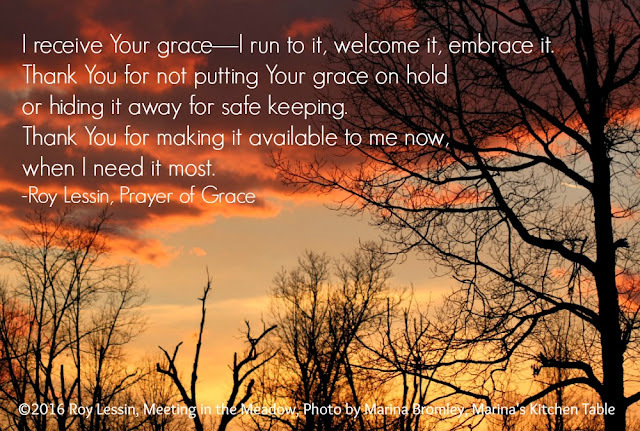 Thank You for not putting Your grace on hold or hiding it away for safe keeping. Thank You for making it available to me now, when I need it most. Your grace brings me riches in my poverty; sufficiency in my inadequacy; abundance in my lack. I thank You for being so gracious—for your heart of grace that is reaching out, for Your throne of grace that invites me in, and for Your gift of grace. Thank You for Your only begotten Son, who has embraced me in His arms of mercy, and who brings to me the fullness of grace and truth. ©2016 Roy Lessin, Drawing Near Christian Journal, available at DaySpring.com Photo by Marina Bromley, Marina's Kitchen Table.